Back in April 2017, it seemed that the long saga regarding contaminated gas tanks at the former site of Russ Auto Care was coming to a close. 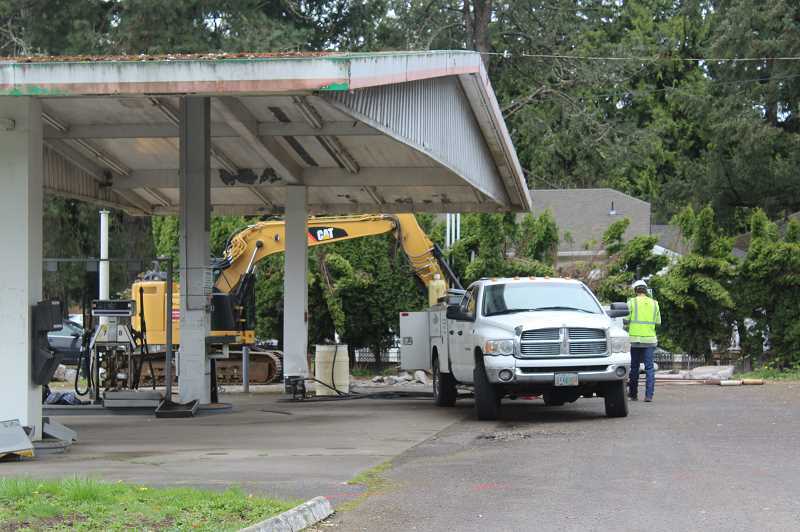 With oversight from the Oregon Department of Environmental Quality (DEQ), contractors finally removed three underground tanks from the site in West Linn's Willamette area — and testing didn't show any signs of significant contamination in the soil. As Mike Kortenhof, manager of DEQ's Underground Storage Tank Inspection Program, put it at the time, investigators "didn't find anything surprising or signs of a new problem." Then they discovered two more tanks that had been previously unaccounted for. "Those," Kortenhof said, "are the current issue." Since the discovery of those additional tanks in 2017, DEQ has issued two penalties to property owner Elizabeth Stein. The first was a "final order" with a fine of $1,538 for failing to register and decommission the two tanks. When Stein did not respond to the final order, DEQ followed up with a Notice of Civil Penalty Assessment this past August with an additional fine of $1,400 for failing to comply with the original order. According to Kortenhof, the last notice was sent by certified mail and returned to DEQ as "undeliverable." DEQ is now in the process of trying to locate Stein to serve the notice in person. The site, vacant since Russ Auto Care closed in 2014, has been under the DEQ designation of Leaking Underground Storage Tank (LUST) for 25 years. According to DEQ, the contamination first came to light in 1993 when gasoline tanks on the east side of the property were removed and found to have leaks. Newer tanks on the west side of the property remained in place underground, which officials said was the cause for continued concern at the site. In 2011, DEQ Natural Resource Specialist Bob McCoy — who has since retired — performed an inspection at the site and found that while the newer tanks contained fuel, all monitoring equipment had been turned off. As a result, there was no way of knowing if another leak had occurred. DEQ ordered Stein and Russ Auto Care owner Russ Leinbach to address the issue, but repeated requests were ignored. Over the next five years, a number of citations and fines were issued, and in 2013 Leinbach pleaded guilty to a single misdemeanor. DEQ issued a $4,384 fine to Stein in 2015. That penalty was increased when November 2016 rolled around and the decommissioning was still not complete. Finally, Stein agreed to pay a portion of the fine and have the tanks removed by April 2017, with the understanding that she would be responsible for the full $10,791 penalty if she failed to do so. After the removal process was completed, DEQ discovered two more tanks. "(They were) long-abandoned, we think, on the east end of the property — almost at the end of the sidewalk," Kortenhof said. "The contractor at the time reported that ... they contained what looked like waste oil — a mix of water and oil — indicating they weren't emptied or closed." The variety of unknowns associated with these tanks has DEQ worried. "We don't know whether they leaked and what the significance is, so they're a higher level of concern than the empty tanks we removed before," Kortenhof said. "But you can't say how high of a level of concern (until they're examined). ... (We're) considering what next steps we can take to expedite the work, either by Ms. Stein or by us." DEQ isn't the only agency that's frustrated by the elongated clean-up process at the site. The City of West Linn has also been monitoring the situation, and watched as a number of prospective developers walked away from the site in the face of so many unknowns. "Our hope would be that the property is cleaned up correctly in order to protect health and the environment. This is the first necessary step to getting the property revitalized with a use that complements the historic Main Street area," West Linn Community Development Director John Williams said in an email. "We have so few developable commercial properties that having any kept on the sidelines is frustrating. We've had interest from potential new businesses but they have not had any success in working with the current owners." One of those interested businesses was Solvana Brewing, which currently operates out of a garage in Gresham. After meeting with Williams in 2017, owner Steve Wesley and his business partner envisioned building a brewery and taproom on the site, with the possibility of food carts as well if the City opted to allow them. "We had some creative ideas about how to maximize the space," Wesley said. "We were all pretty excited. We thought it was a pretty great location, and we could do collaborations with the (Willamette Ale & Cider) folks." After working with an attorney to get in touch with Elizabeth's husband, Scott Stein, Wesley thought he was on his way to an agreement. "(We) thought we were going down a pretty positive direction," Wesley said. "I let Scott know that I'm actually an environmental engineer, and I would do all of the necessary work plans, letters to DEQ — save a ton of money by doing lots of the work." Scott Stein did not respond to a request for comment. Yet Wesley was unaware of the discovery of two additional tanks, and in October 2017 he received a text from Scott Stein with an overview of a potential deal. In the message, Stein told Wesley that he had several other businesses that were already willing to accept his terms. Stein's proposal wasn't palatable in Wesley's eyes, and he never heard back from the family after sending his response. The property, meanwhile, has remained vacant since that point. "Every three months I drive by, and I still see it sitting there," Wesley said.